O: Diademed hd of Antiochus XI r, bearded, diadem ends falling straight behind, dotted border. R: BAΣΙΛΕΩΣ ANTIOXOV in two lines on r., EΠΙΦΑΝΟVΣ ΦΙΛΑΔΕΛΦOV in two lines on l., Athena stg. l. holding Nike outside inscription and resting hand on grounded shield, spear propped in crook of elbow. Control: outer l. above bunch of grapes (which are off flan). There are three examples listed in the Catalogue of Greek Coins in the Hunterian Collection; University of Glasgow, III weighing in at 7.419 g, 7.9 g and 8.42 g respectively. They do not appear to be plated in the catalogue, though are described as "slightly bearded". In Anatolian Studies, Vol. 23, Aşvan 1968-1972: An Interim Report (1973), pp. 187-190, Anthony McNicoll writes of a find that was identified as "?Antiochus XI", but is clearly an Antiochus VIII likely SC 2318 example. This raises the census to 9 (?) of the SC 2442 variety. Likely more out there? 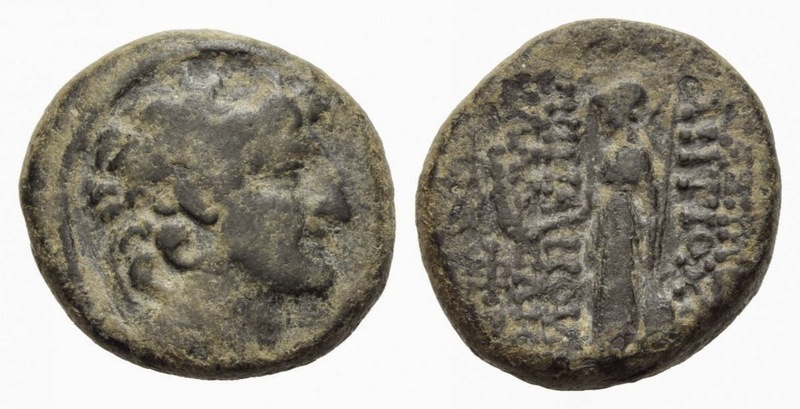 Update 9 April 2015- An online auction Solidus Numismatik On-line Auktion 5 (26 April 2015) has an example LOT 111 identified as SC 2442 but may be the beardless variety. It is 21mm and 9.44g. This appears to be heavier than the previously recorded examples by about a gram.